So I received an e-mail from Mark Davison. 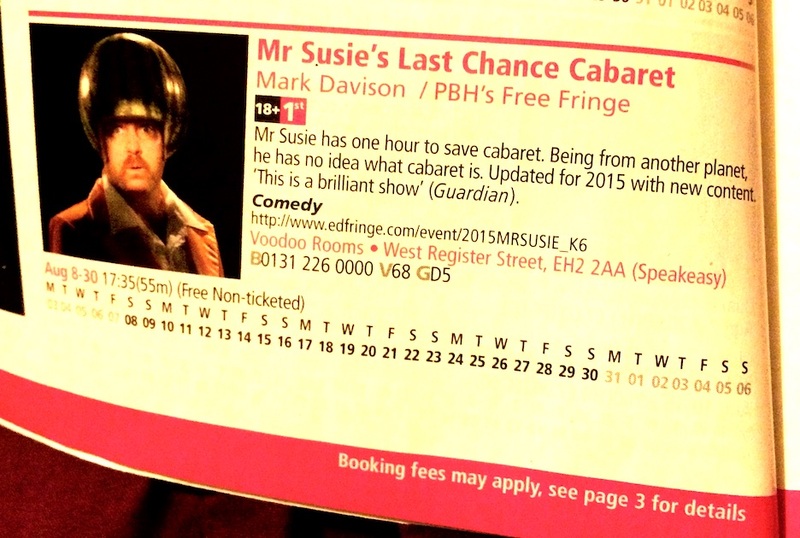 He is billed to appear at the Edinburgh Fringe this August in his show Mr Susie’s Last Chance Cabaret at The Speakeasy in the Voodoo Rooms every day at 5.35pm, as part of the PBH Free Fringe. 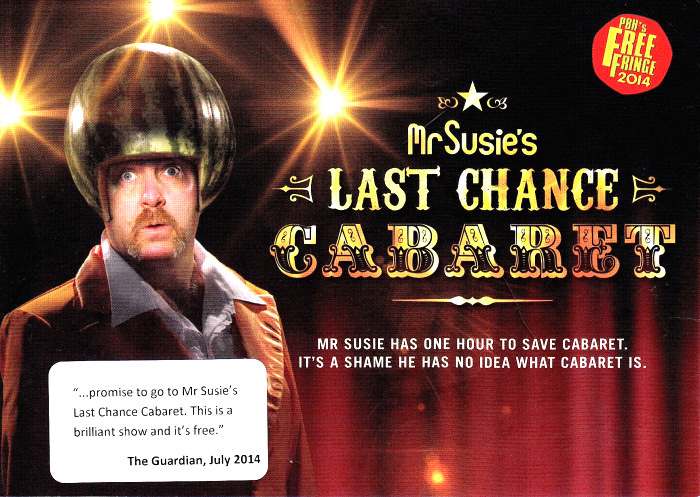 Mr Susie has one hour to save cabaret. Being from another planet he has no idea what cabaret is. Mark Davison (BBC Three’s Cuckoo, C4’s Toast of London and The Doctor Brown Show, he is also one third of online sketch trio The Exploding Heads) returns with last year’s show updated with new content for 2015. “Promise to go to Mr Susie’s Last Chance Cabaret. This is a brilliant show” (Guardian). Nominated for Best Newcomer 2015 at The London Cabaret Awards. You mentioned a few blog entries ago that you weren’t sure if anyone would withdraw from PBH as a result of the Cowgatehead fiasco, so I wanted to give you first refusal on publishing my own statement of withdrawal. I have watched with morbid fascination and mounting horror as the crisis surrounding the booking of shows at Cowgatehead has unfolded. After much deliberation I find that I feel unable to represent PBH at the Edinburgh Free Festival this year. With great sadness and frustration I am withdrawing my show from The Voodoo Rooms. I am aware that this will permanently exclude me from ever working with the organisation again, but such is the depth of feeling I have that this is a sacrifice I am fully prepared to make. As onlookers of this sad turn of events we have no real way of knowing the precise details of who-said-what-to-whom that led to this chaos, and it’s certainly clear that this is a complicated unfolding of events. From PBH’s side, it seems that the timing of the claim to the venue is a little odd, and from Freestival’s side it seems they were acting with some degree of naivety, but any remaining neutrality I may have had was destroyed when a full compromise deal was being offered that would have led to none of the Freestival Acts losing their slots (and thereby their money), and PBH appeared to refuse to entertain it. Refused, even, to attend the meeting that would have discussed such a move. An organisation that will not even consider a plan that will save performers’ time, money and artistic effort, not to mention spare them from a great deal of stress, cannot genuinely claim to have performers’ interests at heart. This is in such violation of what I believe to be the spirit of the Fringe that I simply cannot continue to be a part of PBH. The insistence on exclusivity to PBH is also something that I find deeply problematic. For my part I have always simply ignored it and continued to perform my main show under PBH whilst still performing as a guest for other organisations, knowing that I was taking a risk but feeling that this was a clause in the terms and conditions that was nonsense and therefore worth breaking. But in the specific instance of Cowgatehead the clause takes on a particularly cruel connotation since it instantly prevents any Freestival Acts who are doing other shows with other organisations from even being allowed to apply to retain their existing slot at Cowgatehead. I would love that other performers who are nominally ‘safe’ from this crisis follow suit and withdraw in protest, or at least say something in support of those performers left without a venue. However, I appreciate it is a competitive industry (and an expensive one) and poking one’s head above the parapet is not always an advisable thing to do (it certainly makes no financial sense). I also hope that my slot at The Voodoo Rooms, which in my opinion is one of the best rooms on the entire Fringe, is filled by one of the displaced Freestival Acts, though I obviously have no control over that. 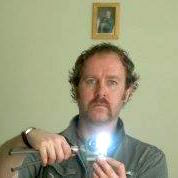 It could well be that my stance is nothing more than a futile gesture, but at least I will be able to sleep at night. It is a crying shame that just as the Free Fringe is becoming a serious, viable alternative to the Big Four, it is being destroyed by the very people who claim to be its guardians. Mark Davison sent that statement this morning to Peter Buckley Hill of the PBH Free Fringe. Yes, I’m losing money. Roughly £800 though thankfully I won’t have lost further cash on my accommodation. I hope to still be in Edinburgh for a week or so this year, doing as many guest slots as I can. And next year I will bring an all-new show, most probably to the paid Fringe. A great act, an honorable man. We love Mr. Susie. The economic model of Peter Buckley Hill and some comedians is Peter can’t afford a paid venue so he walks into a dead pub and they let him stand in a corner and sing some songs and wave a bucket and in return he gets an audience. This is a very simple barter model. We give you a venue, you give up punters, we get increased beer sales. The pub has an entertainments licence and a booze licence already so there are no upfront costs. 2004-2006 Alex Petty & PBH have got 6 pubs between them all with basic stages constructed and some of them with multiple stages per venue. There’s a bit more tech involved and it’s a bit more complicated to set up but basically it’s still a very simple barter model. We give you a venue, you give up punters, we get increased beer sales. The pub has an entertainments licence and a booze licence already so there are no upfront costs. So basically the cost increases with capacity. If you plot it it’s interesting as it’s a wobbly line but let’s say the cost increased linearly with capacity including the costs of “building” the extra rooms etc. Someone said “well it’s a twenty storey building you can just keep adding on rooms”. You can’t …leaving aside heath and safety which is another set of costs… the costs depend on audience number size capacity. All these are additional costs to the old model … they are new costs. And this new micro economy has to be supported by the bar take. It’s one thing having footfall but that has to actually translate into beer sales. So from a business point of view you only want as many stages as can be supported by the beer sales. Putting in “extra rooms” isn’t automatically of benefit to the owners …it could actually be of detriment to the owners. Looking at the bigger picture driving this I think it’s as simple as this. PBH and Alex have simply run out of pubs. So they are adapting non-booze venues and turning them into temporary pubs. But these pubs are close to already existing paid venues and pubs. The more of them you have the more they start to affect each other. Basically the Freestival/PBH are trying to build a purpose built venue like the Underbelly complexes and pay for it through beer sales. But surely even in Edinburgh during the Festival there are only a finite number of alcoholics per square mile. So what happens? Well two things can happen. The Finge continues to expand exponentially and there’s a massive increase in the number of alcoholics per square mile and Alex, PBH, the Freestival and Heroes of Comedy turn the whole of Edinburgh into one giant pub …or the market becomes saturated and beer sales in individual venues fall. Which may be why PBH doesn’t seem to bartering with one venue put 3 to 10 at a time these days. Has anyone counted the number of venues all 4 operators book between them? There are other problems. Because the venue is temporary the licences now have to be paid for upfront and negotiated with the Council. Peter talks about being intimidated by the Fringe office on deadlines. It’s clear that the Fringe program deadline and the deadline for putting in a temporary licence application in are very close together? Is this an accident? Or is it the paid venues protecting their businesses? Then there are the larger political problems …even if it makes a lot of money the Council are going to have problems with the whole town turning into a superpub? If it stops making as much money for individuals…? PBH’s exclusivity rules are closed shoppy if you ask me but looking at it another way what are the two classic solutions to labour oversupply …? Honestly if you ask me the central labour over-supply problem is simply insoluble …every attempt to solve it just seem to create a greater problem of labour over-supply.